Believe it or not I've never had this happen to me. For some reason I've always been drawn to books that are shocking, draining and disturbing. Nonfiction books in particular. I don't know what that says about me. I probably don't want to know. If you haven't read this one, you should. Seriously. This doesn't happen to me either - I quite enjoy emotionally intense/draining books! I am the same exactly! I like reading disturbing, draining reads. What I put down are the boring reads! That's on my list of books to read SOON. We can enjoy our depressing books together! I haven't ever completely quit reading a book because it was depressing. I did take a break from reading All Fall on Your Knees for a couple of weeks, that one is super depressing, but really excellent. I don't know if I've read that one. Hmmm, now I'm wondering! I enjoy dark emotional books also, and specifically about serial killers, NF ones also. The one I can think of is We Need to Talk about Kevin. I tend to be drawn to difficult and disturbing books, too. A long time ago I decided not to probe into what that says about me! 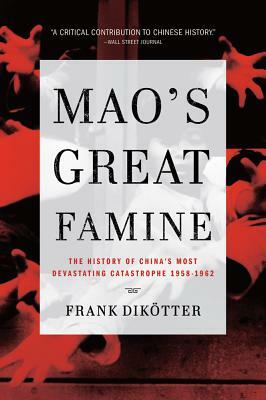 :-) Mao's Great Famine looks fascinating. I agree with Marce about We Need to Talk About Kevin, and I'd add Boy A by Jonathan Trigell. I probably avoid emotionally draining books. This sounds interesting though. This will probably make you chuckle: the most recent books I had to put down for an hour or two every so often were The Cider House Rules and The Midwife of Hope River...for their graphic descriptions of childbirth. I don't do pain, needles, or the b-word, so the childbirth scenes had me squirming (and in some cases feeling very fainty). I'm a big wuss. I want to say thank you to all of the dark book loving folks that commented on this post. I've always wondered if I was some sort of creepy creeper to enjoy those types of books so much. That may be the case, but at least I'm not alone!